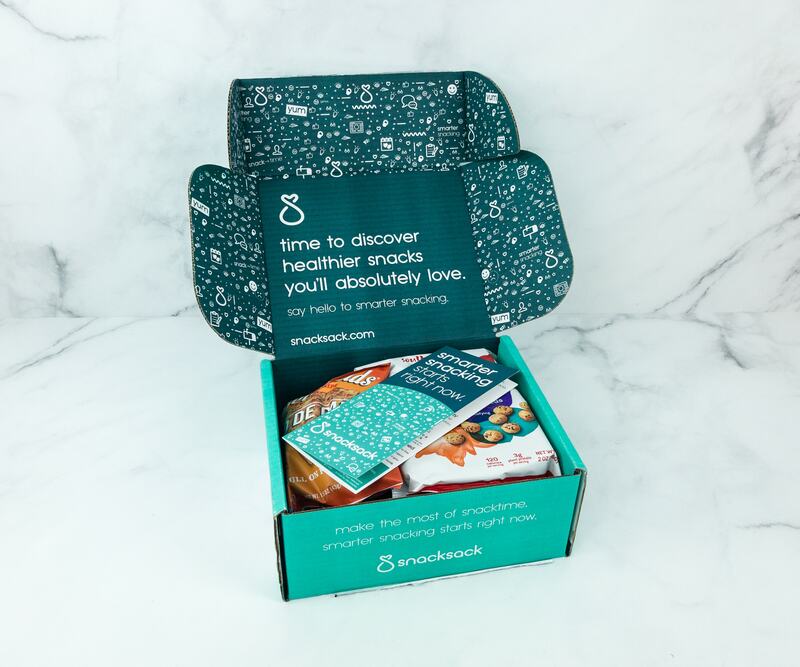 SnackSack is a monthly subscription service that sends boxes filled to the brim with a combination of organic, non-GMO, gluten-free, all-natural, vegan and fair-trade snacks to your door every month! 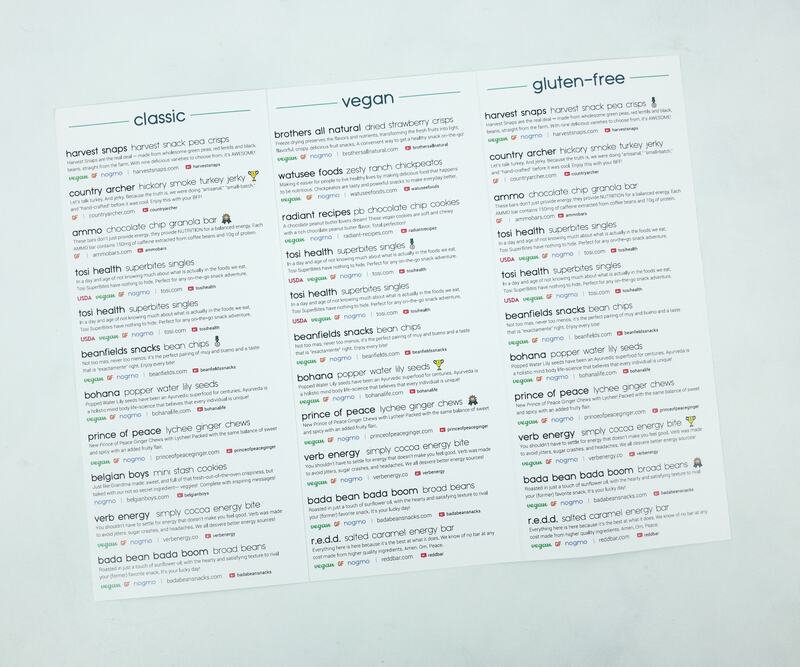 SnackSack now offers two new subscriptions – SnackSack Vegan and SnackSack Gluten-Free! 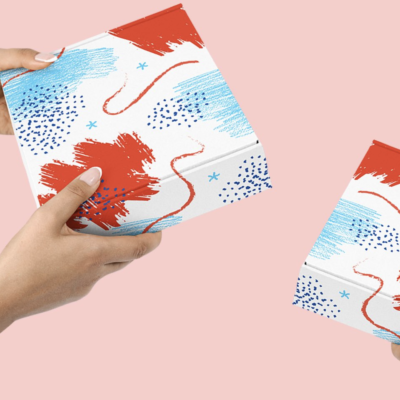 Regular SnackSack is still priced at $22 per month, while the new SnackSack Vegan and SnackSack GF will be available for $24 per month. Plans are also offered in 6-month and 12-month options, plus they now ship to Canada! DEAL: Get 15% off the entire lifetime of your subscription! Use coupon code HELLO15. There’s a pamphlet on top of the snacks. Everything arrived stacked neatly in the box. The pamphlet has all the necessary information about the snacks in the box! This is a review of SnackSack Gluten-Free. 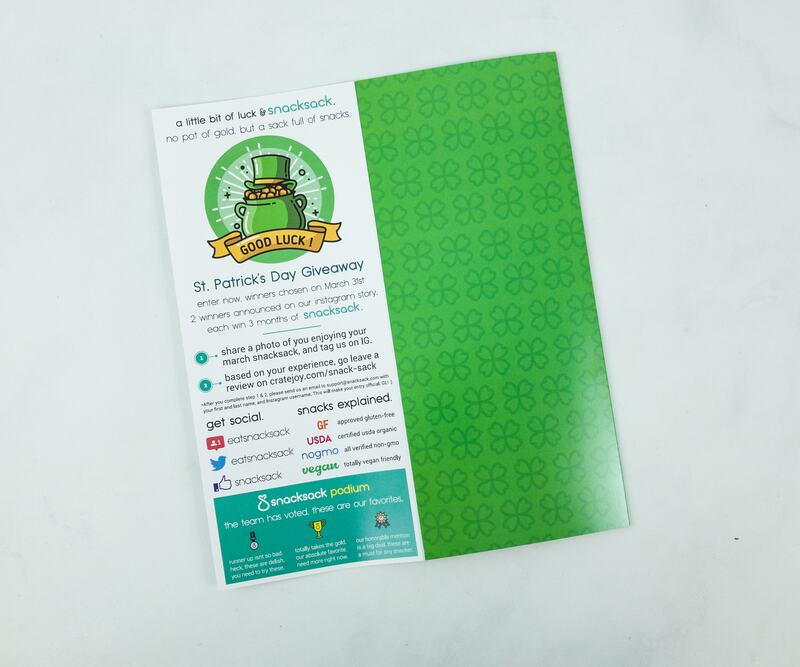 This month’s theme is St. Patrick’s Day! Here’s the list of all the snacks! 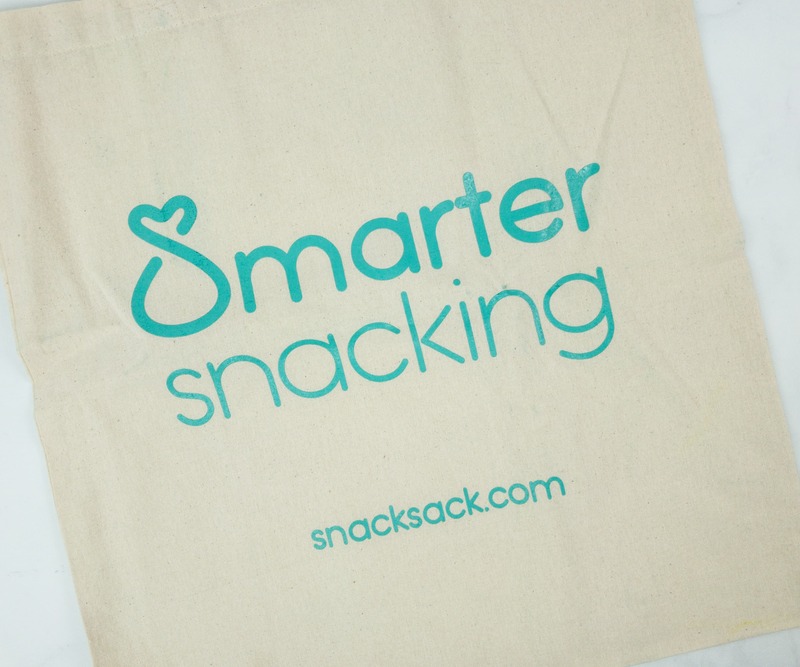 Snack Sack makes it easy to find the gluten-free, vegan, and non-GMO snacks at a glance. 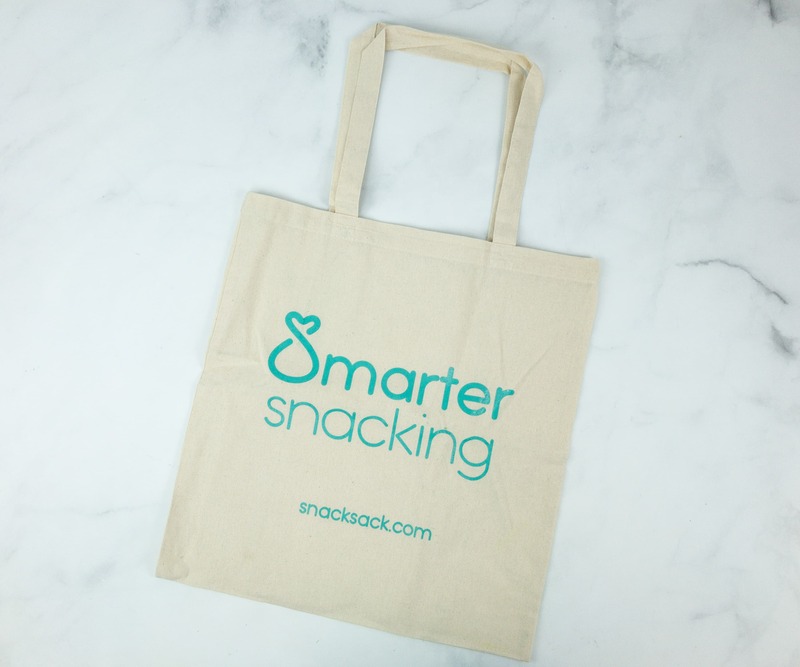 Each month, SnackSack includes a cute tote bag with “Smarter Snacking” printed on it. This is where you can stash all your snacks and treats. Everything in the box! 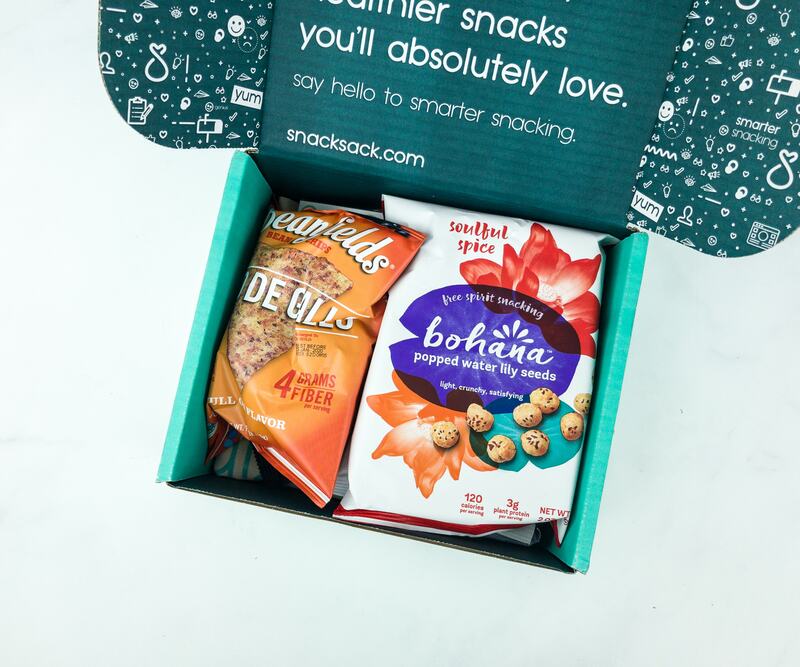 Snack Sack sends between 11-15 snacks a month. 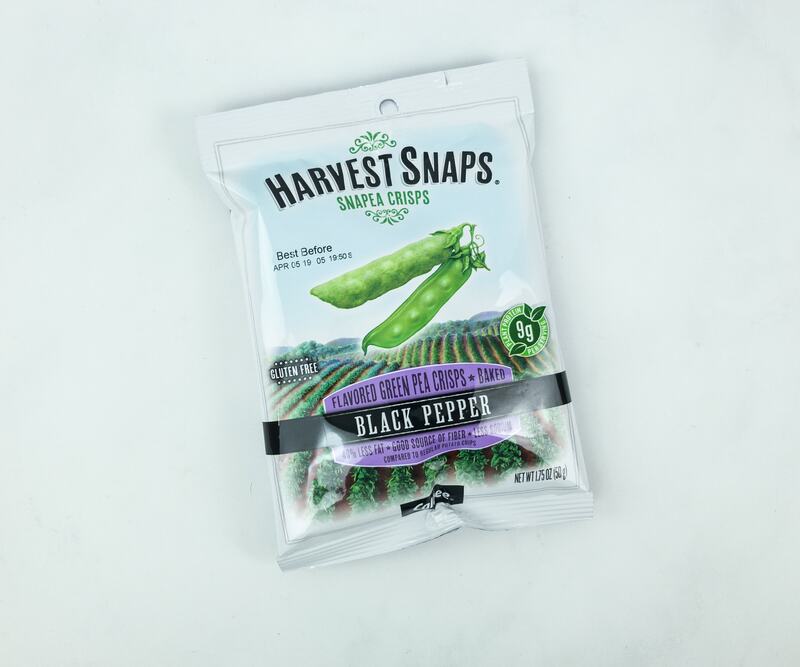 Harvest Snaps Black Pepper Snapea Crisps ($1.08) This tasty snack is made from baked green peas! It’s flavored with black pepper and also packed with protein and fiber to fuel up your body. 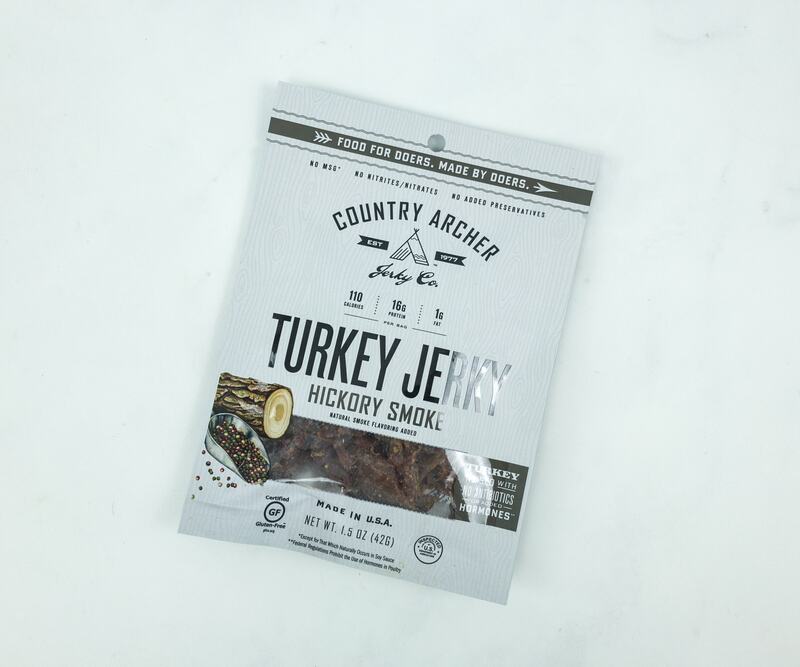 Country Archer Turkey Jerky in Hickory Smoke ($3.49) Moist and chewy, this jerky snack is made with grass-fed beef. It’s a great on-the-go snack filled with protein, fiber, and other essential nutrients that can help sustain you in between meals. It’s free from gluten, nitrate, MSG, hormones, and antibiotics. 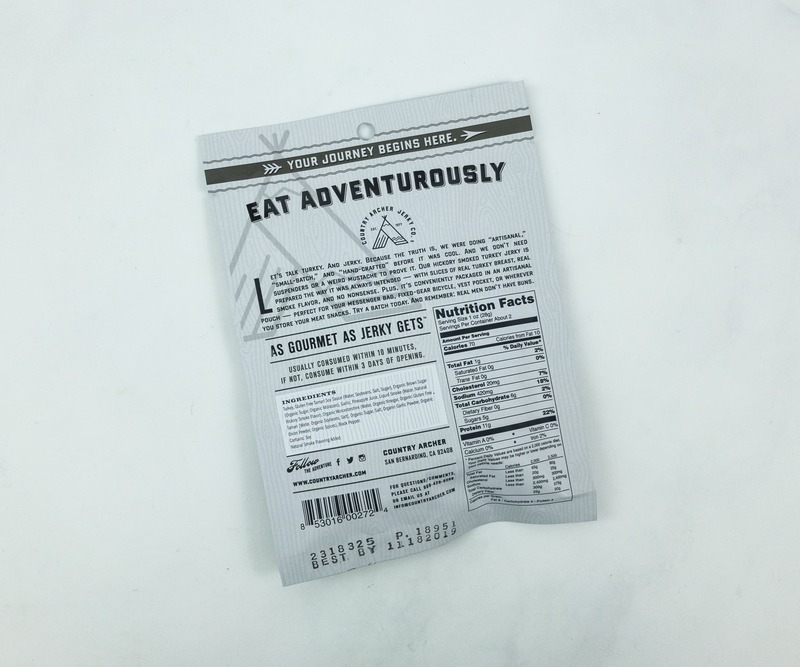 This jerky is also perfect to bring for camping, hiking, traveling, or just a quick snack break. 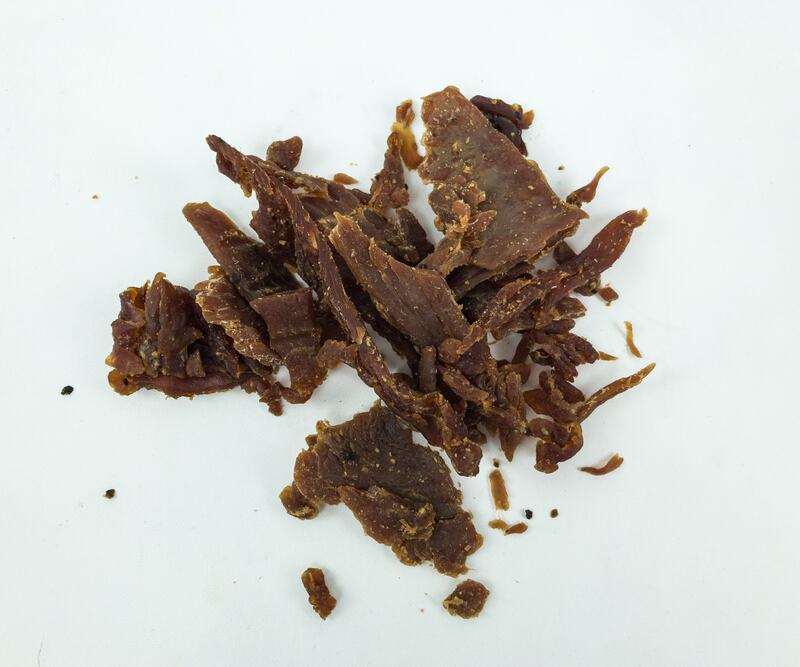 The jerky is so chewy, but not the type that would hurt your jaw after eating a few pieces. I like its tenderness and its flavorful taste! 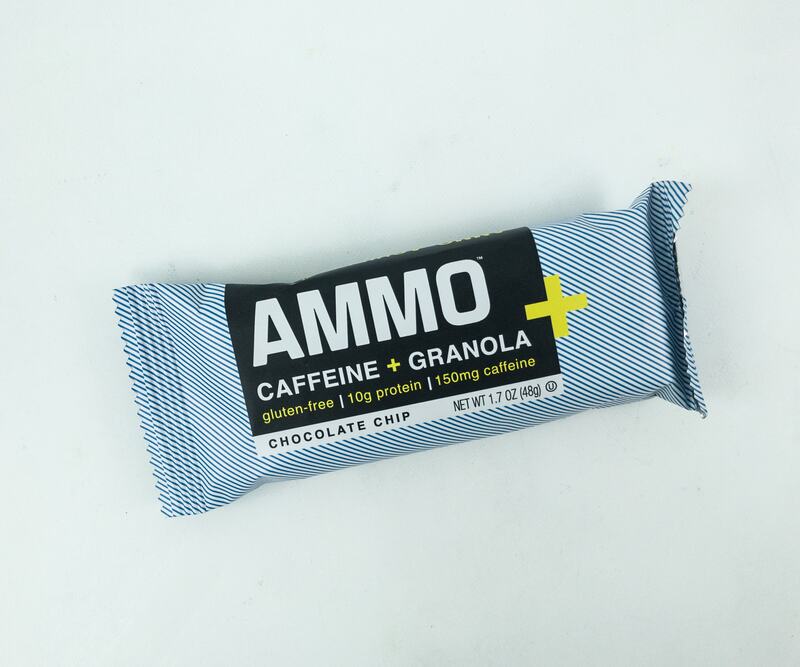 Ammo Caffeine + Granola Chocolate Chip Bar ($1.83) Another perfect grab-and-go snack is this gluten-free chocolate chip bar! It contains protein-rich granola mixed with caffeine and chocolate chips. Each bite oozes with a rich chocolaty taste, and it kept me full and energized for a whole afternoon. It’s the ideal snack to have whenever you feel tired or hungry! 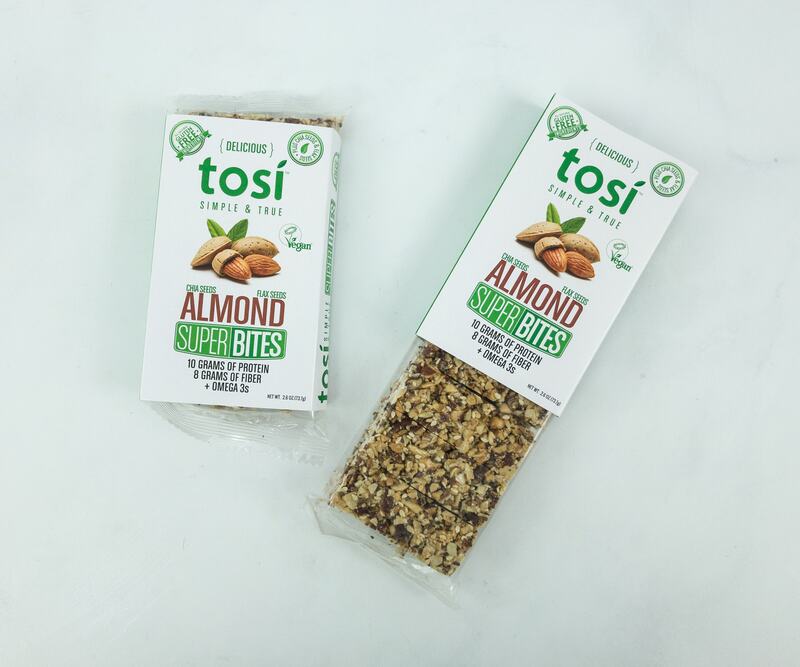 Tosi Simple & True Almond Super Bites ($5.70) Chia and flax seeds, both known as superfoods, are combined in this snack. Aside from being gluten-free, it’s also rich in protein, fiber, and omega 3 that is good for the heart. Each pack contains 5 bite-sized chewy bites, perfect for sharing with your friends and family. 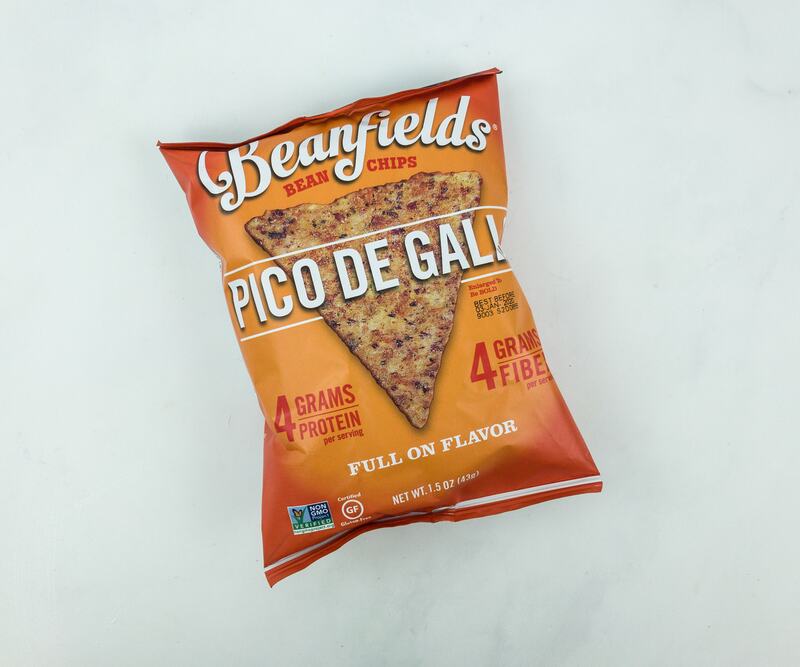 Beanfields Pico De Gallo Bean Chips ($1.99) These bean chips make a healthy alternative to your usual greasy junk food. Each pack contains 4 grams of protein and fiber that is equivalent to one meal. The Mexican salsa-inspired flavor makes it really irresistible! 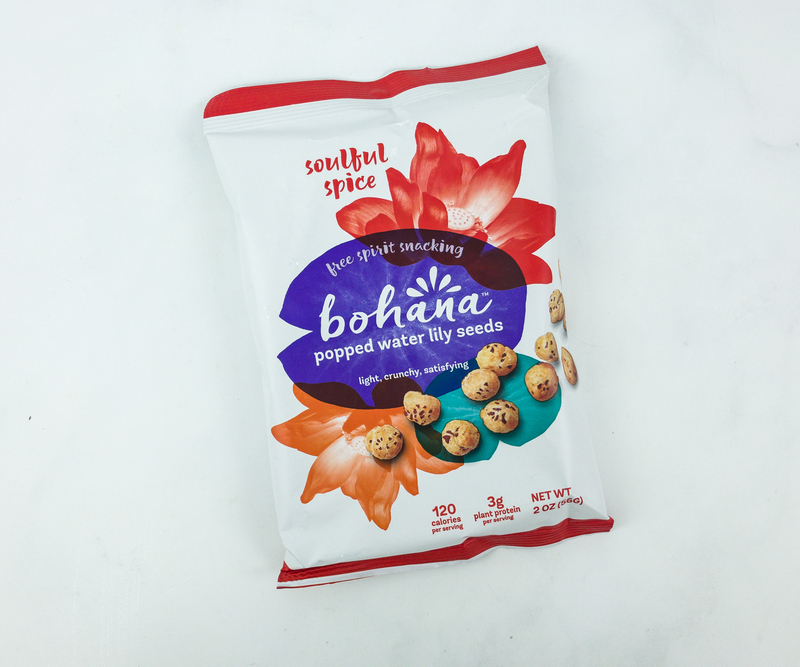 Soulful Spice Bohana Popped Water Lily Seeds ($3.33) It’s a light, crunchy, and healthy snack made from air-popped water lily seeds sprinkled with a bit of white cheddar and Himalayan salt. 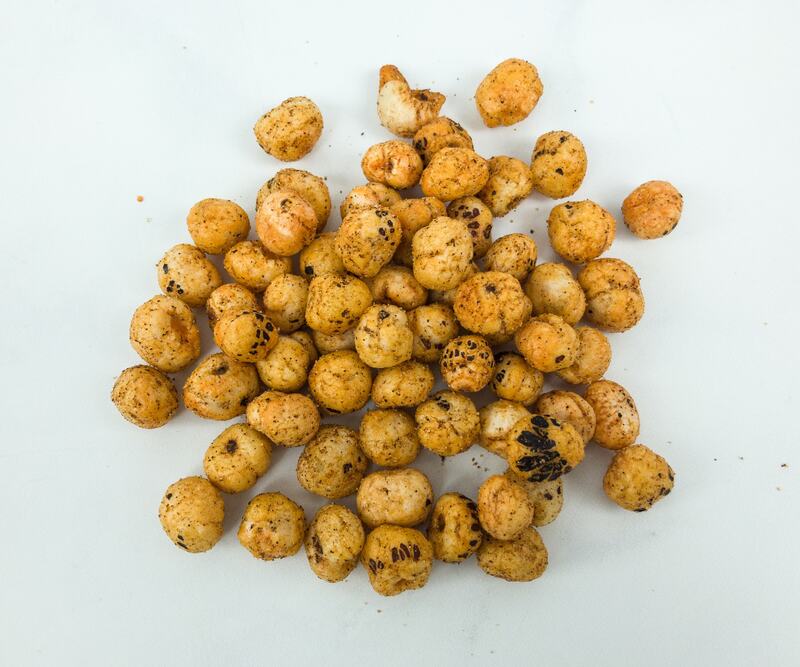 It’s a totally crunchy and puffy snack that contains 3 grams of plant-based protein which is 50% more than your regular popcorn. With a super low-calorie content, you can eat as much as you want without guilt. It also contains 9 essential amino acids. I loved this snack, my wife wasn’t crazy about it. 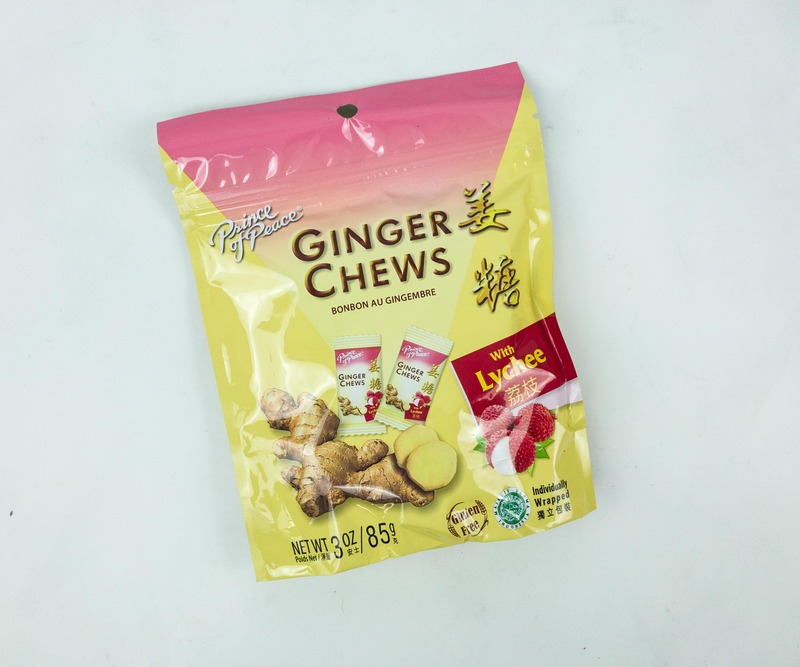 Prince Of Peace Ginger Chews ($4.58) I know that ginger chewy candies are really healthy, but I never expected it to be this tasty especially with lychee! It’s more spicy than sweet, just like how ginger candies are really supposed to be. 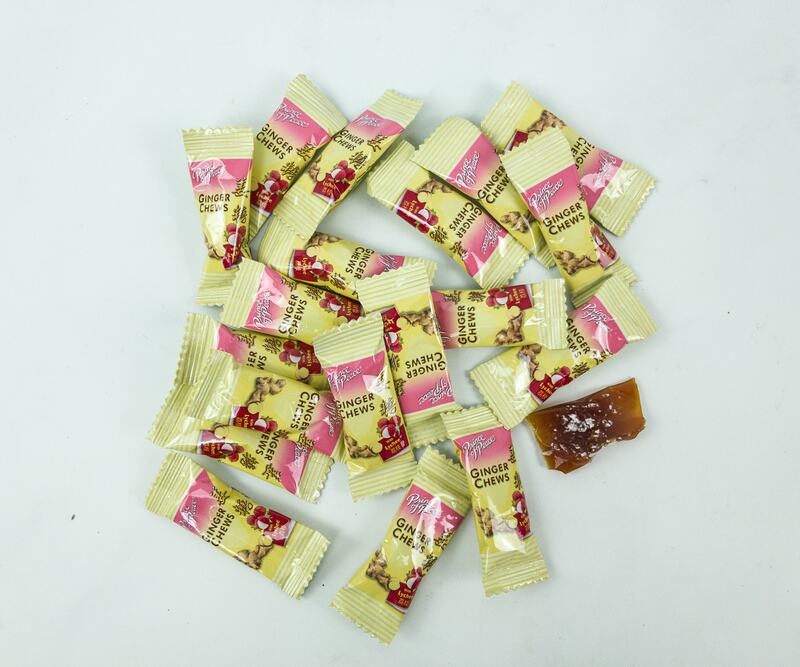 Each pack consists of 20 pieces of individually wrapped candies, which is great for sharing. 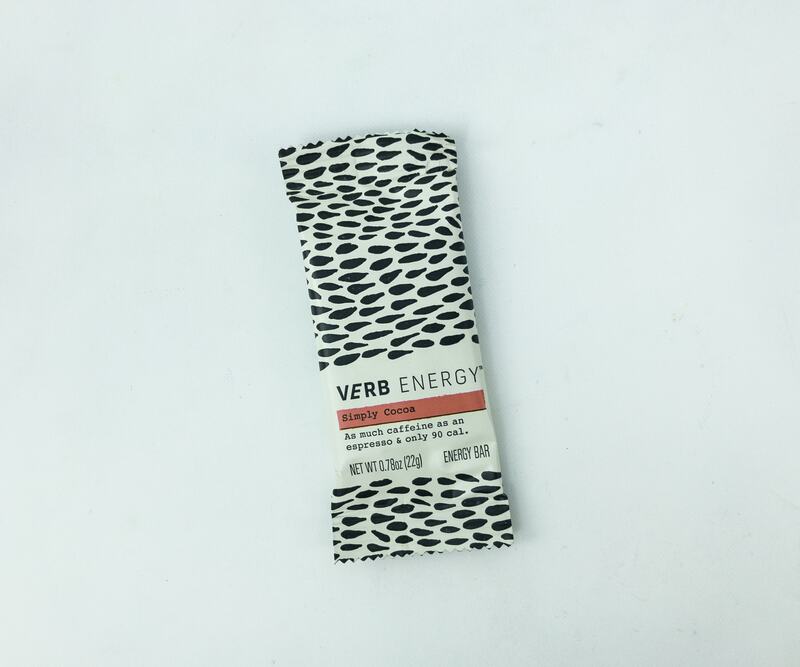 Verb Energy Simply Cocoa Energy Bar ($1.50) This bar contains as much caffeine as an espresso but with only 90 calories. Its caffeine came from organic green tea, which provides lasting energy that will definitely boost your focus and concentration you’ll need for the day. 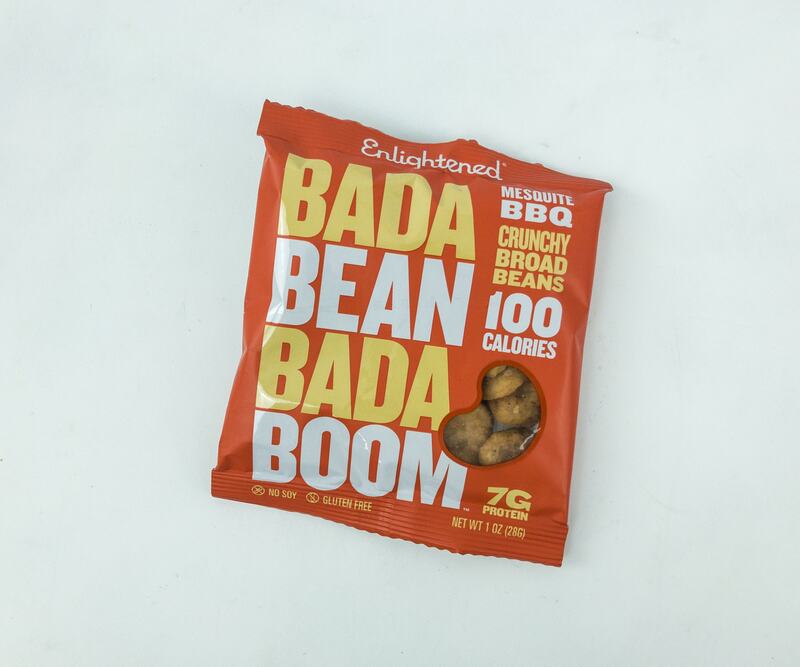 Enlightened Bada Bean Bada Boom ($1.40) I can’t get enough of these lightly roasted fava beans! Each piece is crunchy and flavorful. Since it’s cooked using sunflower oil, it’s way healthier than other regular bean snacks. It also contains sea salt, garlic, and chili powder that make it really tasty. Aside from being gluten-free, the snack is rich in fiber and protein. R.E.D.D. 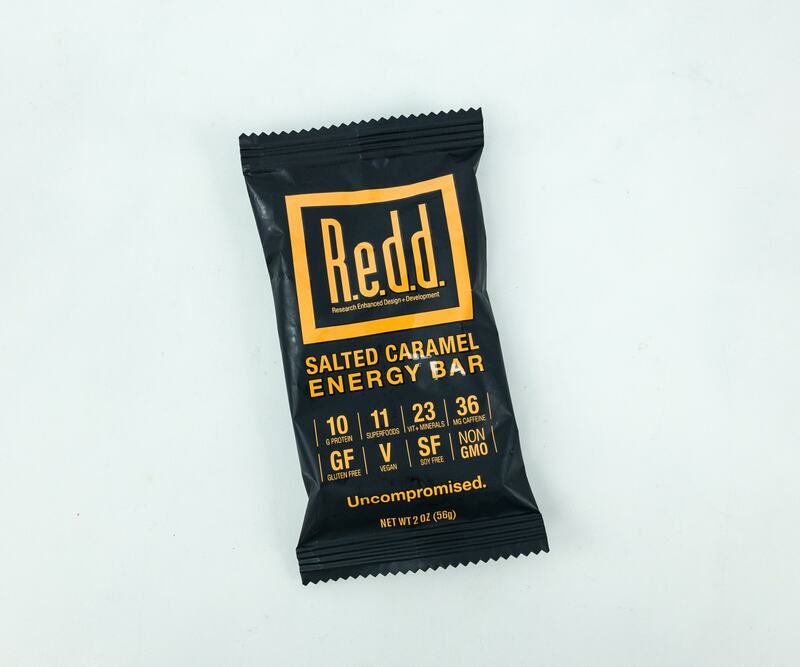 Salted Caramel Energy Bar ($2.49) Anything with salted caramel in it is fantastic! This energy bar didn’t disappoint because it was sweet, filling, and energizing. It’s also packed with protein, equivalent to 3 egg whites, plus 23 vitamins and minerals. Its natural caffeine content is also equal to a 1/3 cup of coffee, providing you a little boost of energy whenever and wherever you need it. 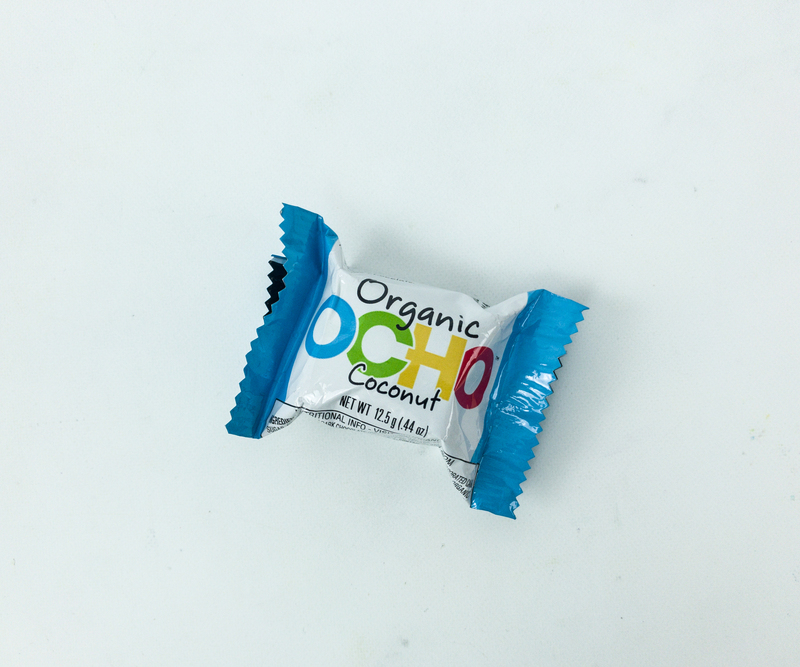 Organic OCHO Coconut ($1.37) If you love coconut, this snack is a must-try! It’s a vegan, organic, and gluten-free bite-sized snack made with organic coconut flakes, cane sugar, and vanilla coated with creamy dark chocolate. It’s so delicious, I wish I had more! It was a sweet little bonus item. 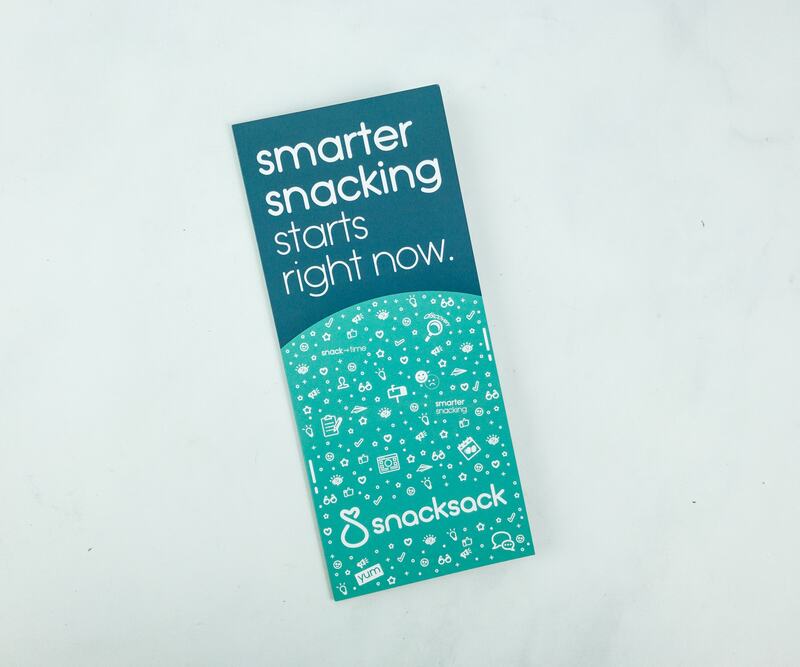 Switching to healthy snacking is made easier by SnackSack! 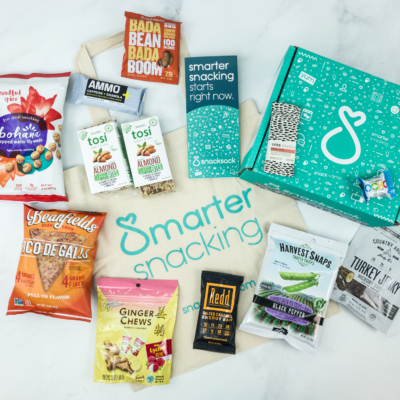 This month’s gluten-free box includes a variety of scrumptious and mouthwatering treats, including sweet, chocolaty, and savory snacks. Most of them are ideal for on-the-go snacking too. It will not just keep you full, but also makes sure you get what’s good for your body. All in all, it’s an excellent box for sharing with the family. It’s really fun discovering new healthy snacks together! 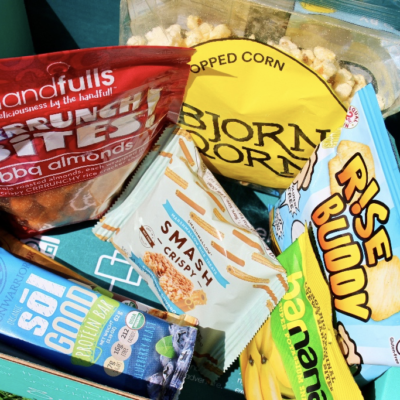 We’re really excited to see more healthy and delicious snacks in future boxes! 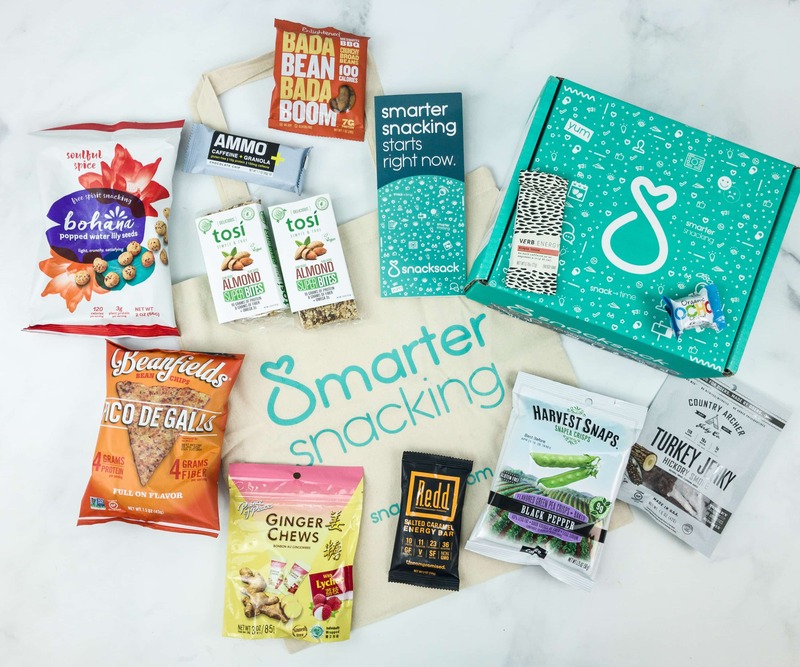 What do you think of this month’s SnackSack Gluten Free? Visit SnackSack to subscribe or find out more!